On January 11, 2000 we tragically lost Brianna due to a traumatic accident. Please read Brianna's story,"Our Tragic Story", so this doesn't happen to you. Brianna was a happy, somewhat "mouthy", girl. She loved to talk to you (or was it "back at you"). She got along well with all our other dogs. She was protective, alert, full of energy and loving. She produced some very lovely puppies. Four of Brianna's get are Champions. Am/Can Ch. Cam's I Seek The Magic (Isaac, DOB 9-18-96) is an American and Canadian Champion with Group wins. 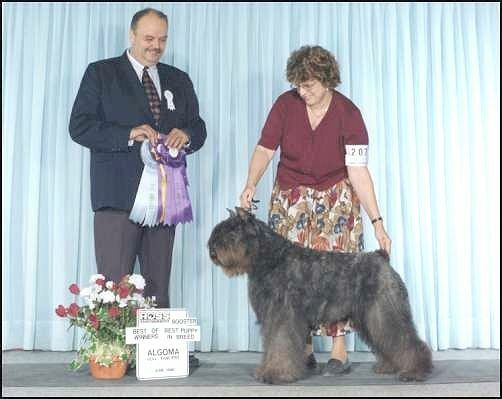 Isaac won best Junior Dog at the 1997 National Specialty (The American Bouvier Des Flandres Club Specialty in Washington D.C.). Am/Can Ch. Cam's Uproar at Marlee (DOB 9-18-96), and Can. Ch. Cam's Mataya Lee (DOB 8-4-97) are two of her daughters shown below. 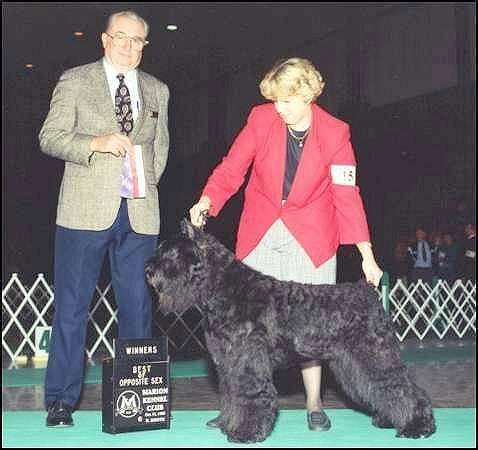 Brianna's youngest son was Am/Can Ch. 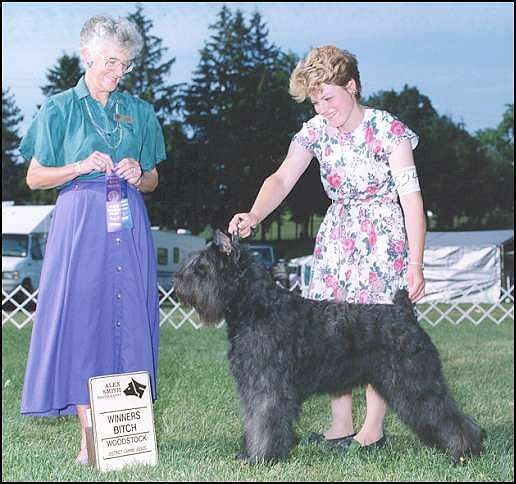 Cam's Jack Hammer (DOB 4-21-99) At The Bouvier Des Flandres Club of Southeastern Michigan Specialty in 2000, Jack won Winners Dog for a five point major, Best of Winners, and an Award of Merit. This was Jack's first show and he was only 7 months old! And Jack's littermate, Cam's Mikayla Lee, also won her class. Mataya is a very sweet girl. She tends to be a little shy but is very devoted to us, her family. We are working on her shyness by taking her many places, socializing her. She is very loving but prefers her family to strangers.